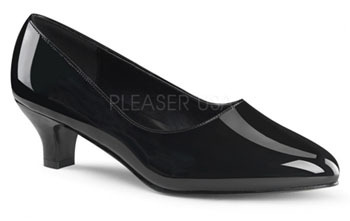 The Pleaser FAB-420W is a 2 inch heel black or red patent court shoe. Available in large sizes. Please allow a few days in case they have to be ordered in. Available in: Black UK 9(EU 42-US 12),Black UK 10(EU 43-US 13),Black UK 11(EU 44-US 14),Black UK 12(EU 45-US 15),Black UK 13(EU 46-US 16),Red UK 9(EU 42-US 12),Red UK 10(EU 43-US 13),Red UK 11(EU 44-US 14),Red UK 12(EU 45-US 15),Red UK 13(EU 46-US 16) We might be able to get smaller sizes and different colours if asked.